Rejoice! Zen Lizard announced its 30 free presets for Animoog. 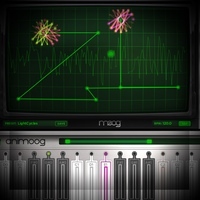 These great news required me to proceed with the first update to the recently introduced list of Expansion Packs for Animoog, now at version 1.1., where you’ll find plenty other sources of free presets for our beloved instrument. There were several improvements to the list, including the addition of Moog’s BASE Pack which was missing from the initial release of the table. Thanks to an anonymous user comment , we now have the associated URLs for this BASE Pack. If you’re aware of other sources of free presets or would like to share corrections, please let me know! Enjoy the new Altermoog presets!